Deputy Foreign and Expatriates Minister Fayssal Mikdad discussed with the UN Under-Secretary-General for Humanitarian Affairs and Emergency Relief Coordinator Mark Lowcock means of enhancing cooperation and joint action between Syria and the UN in the humanitarian field. Mikdad affirmed that this visit comes amid positive developments witnessed by Syria recently and the victories achieved by the Syrian Arab Army on the ground by defeating terrorists in many areas, and coincides with the start of the return of many citizens to their cities and villages and Syrian displaced to their homeland. He pointed out that Syria is continuing its struggle against terrorism until the liberation of the entire Syrian territory and putting an end to the suffering of the Syrians who were affected by this terrorist war. Mikdad also noted that these positive developments achieved by the Syrian Arab Army allows the UN humanitarian organizations to play their role in meeting humanitarian needs more effectively and reaching the Syrians who need this assistance. In turn, Lowcock reviewed a number of issues of common concern. 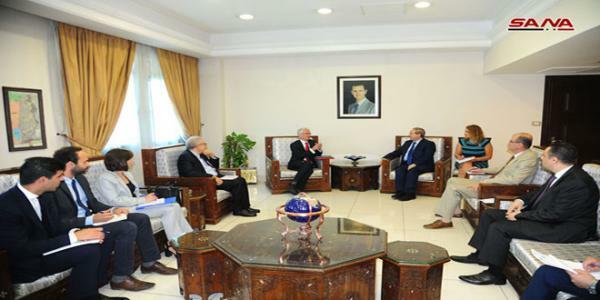 He said that the visit comes within the framework of reviewing Syria�s view regarding the role that the UN should play in the humanitarian affairs and priorities for the coming phase. He pointed out that the UN looks forward to working jointly with the Syrian state to assess needs and work to meet them.